Whilst at the Tate, I also took a look at their ‘A Walk through the Twentieth Century’. Now, I think this is a great idea; it gives a good idea of the development of art and art movements throughout the twentieth century, and I also saw many old favourites (such as Stanley Spencer, The Woolshop (1939), Mark Gertler’s startling and fascinating paintings, The Mandolinist and Merry-go-round, also Vanessa Bell, Winifred Knights, Gwen John, etc. But what really struck me is how much I simply cannot appreciate some types of art. 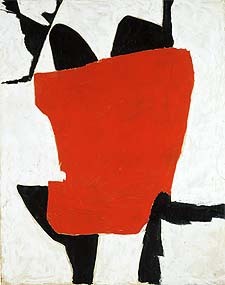 There was a painting by Roger Hilton, called simply February 1954. Now, Hilton is a well-respected artist, whose artistic integrity encourages him to name paintings by the month and year in which they were painted, so that viewers will properly engage with the art, rather than with some figurative or perceived narrative aspect of the painting. I understand this. Apparently, I don’t really understand abstract art, though. Because this is the painting, and all I can think when I look at it is: Man being eaten by chair. Possibly watched by a bird. I realise I am being facetious. If you have some proper insight into this painting, please let me know.